The Administration and its supporters will tout that the federal deficit is at the lowest level since 2008 which is due to a (relatively) improving economy and the sequestration. But, as the report states, “[u]nless substantial changes are made to the major health-care programs and Social Security, those programs will absorb a much larger share of the economy’s total output in future than they have in the past.” In other words, without entitlement reform, the status quo is unsustainable. 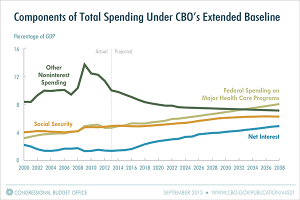 • About 23% of spending goes to healthcare, such as Medicaid and Medicare. 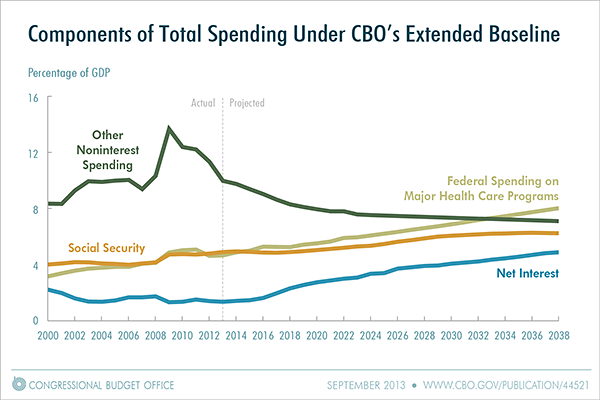 This is increasing faster than any other part of the federal budget. • About 22% is spent on social security. Funded by the payroll tax, there were surpluses in the social security trust fund for many years. However, given the baby boomers and how people are living longer, the trust fund is will be empty by 2033. • An alarming 6% is spent on paying interest on the debt. This will only increase in the future as our country owes more and interest rates rise from their historic lows. • About 20% goes to Defense. As a result, without touching the biggest drivers of the debt – entitlements – Washington cannot take the country off its current path to fiscal insolvency. Fortunately, a debt crisis won’t happen tomorrow – so we can drive down the long-term debt by reforming future entitlement spending today. Still, this requires tough decisions that the majority of Congress and the President have been unwilling to make. Now, what would happen if lawmakers continue to do nothing? One result of a debt crisis would be, according to the CBO, “very high interest rates” on government bonds as it gets more risky to invest in the U.S. This would result in a dramatic dumping of U.S. bonds in favor of something more safe (the rmb anyone?) and making it more difficult to borrow money. The fiscal situation also directly affects our national security and ability to project power around the world. If the U.S. cannot influence the world to be more free, democratic, and capitalistic, then our rivals will fill that void and remake the world in a way that is abhorrent to our values. The CBO report also gives us a chance to reflect on what type of society we want for the future. If adjustments are not made to entitlements, major, immediate cuts will be forced on us down the road. This is happening in Detroit as many city workers will likely see their pensions decimated. Moreover, the spending on entitlements and interest on debt will soon crowd out essential investments, such as Defense, roads and infrastructure, research at the National Institute of Health, and NASA. This jeopardizes the very notion of American exceptionalism. During the 2012 campaign, Vice President Biden liked to say: “Show me your budget, and I’ll tell you what you value.” If the federal budget does not contain serious entitlement reform, then it’s clear that they value something other than the American people and our country’s future. As long as there are deadbeats that refuse to get a job and we continue to enable them, the expansion of entitlements and the federal deficit will never stop. Previous Previous post: Was There a Confederate Emancipation Proclamation?